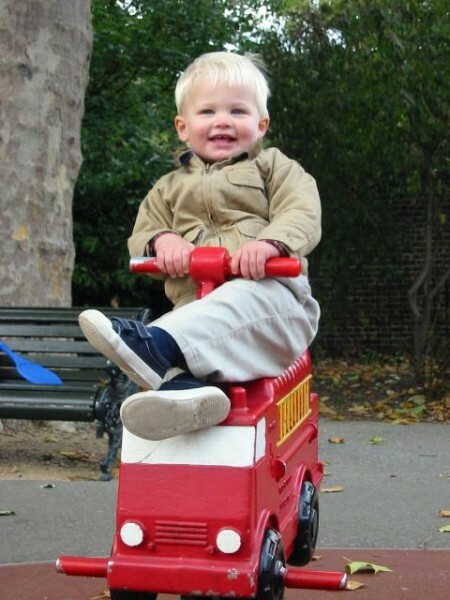 The first time we went to Greenwich, England, Tommy was a toddler. We visited all of the attractions, spent the entire day in fact. But what I primarily remember about it was that we got what may have been the best Christmas card photo ever on the playground. Oh, and Matt and I had some kind of fight about where to eat dinner that led to a stompy walk around downtown and a ghastly meal in a sub-par Italian restaurant. But I digress. As you can imagine, I was eager for us to return so that I could actually spend a little time inside the museums instead of tearing around their perimeters. 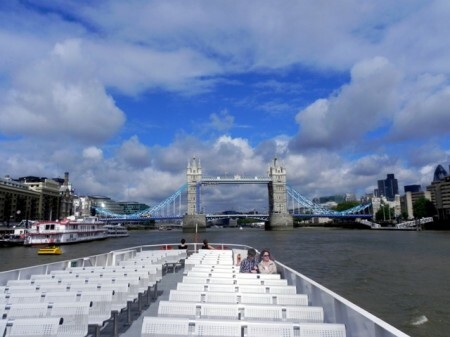 I also wanted to take a boat to get there (we took the train last time) so that I could experience my journey as the Tudor monarchs did, albeit it minus the royal barge. And leaving early on a Sunday morning, we did have the boat mostly to ourselves, much as the queen would. We started our ride at the Tower of London and the trip lasted about 25 minutes. Teddy kept an eye out for river dolphins while Tommy, well, he poked his brother and poked me and then put my sunglasses on. Because if you don’t think that’s funny, you don’t know from funny. And what else is there to do on a boat ride? We were disappointed when we arrived to discover that the Cutty Sark, the famous clipper ship that is docked in Greenwich, is closed for renovations. In fact, it was completely shrouded in a white plastic and so we couldn’t even admire it from the outside! Travel-with-kids tip: The Cutty Sark is recovering from a fire, but generally speaking if you are planning to visit the London area anytime during the next year, I’d recommend double checking that the attractions you want to see are open and accessible – numerous roads, train lines, and museums are being renovated in preparation for the 2012 Olympics. 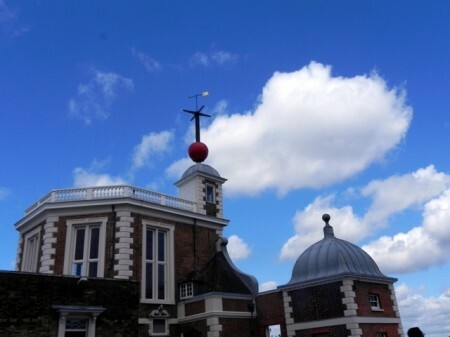 Flamsteed House, the original observatory building with its famous red Time Ball, which rises to the top of its mast every day at 12:55. The house is where the royal astronomers used to live and also contains the famous and beautiful Octagon Room designed by Christopher Wren (another little project he’s famous for is Saint Paul’s Cathedral). A 28-inch telescope, the seventh largest in the world. The Time Galleries, containing an extensive exhibit of clocks and other timepieces including the first timepiece to keep accurate time at sea (which won the Longitude Prize). 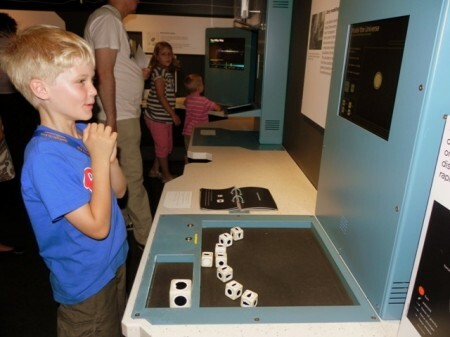 The Astronomy Galleries which contain lots of hands-on exhibitions. This is where we spent the bulk of our time. We touched a rock that is 4.5 billion years old. 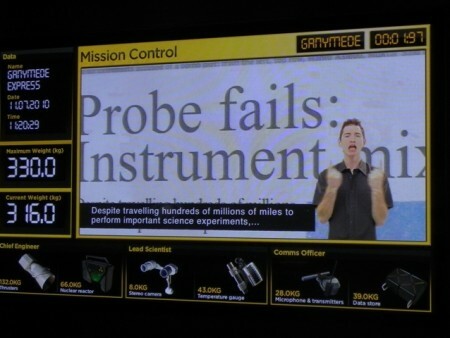 and studied black holes and starlight. There weren’t very many people in this room and so we were able to really spend time at each station. The only thing we didn’t do was see a planetarium show, mostly because we were so busy with everything else and by the time we finished it was time for lunch. 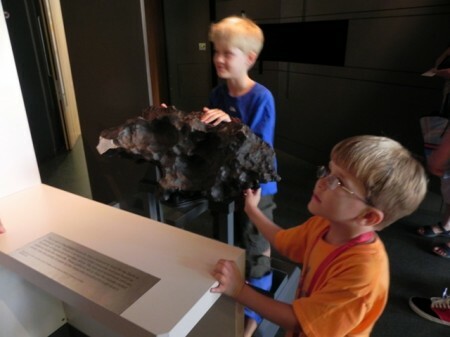 Travel-with-kids tip: The museums at the Royal Observatory are best for kids older than five and who are interested in history and science, although the planetarium does offer shows aimed at younger children. You might consider doing a bit of research in advance of your trip (or at least look at a globe) so that your child is familiar with latitude and longitude. After fueling up at the Greenwich Market, the kids were ready to run. Tommy hadn’t forgotten the playground where the famous photo above was taken and Matt graciously offered to take the boys there while I spent a peaceful hour exploring the Queen’s House. Constructed by James I for his wife, this classical building was designed by Inigo Jones and is a stunner inside and out. 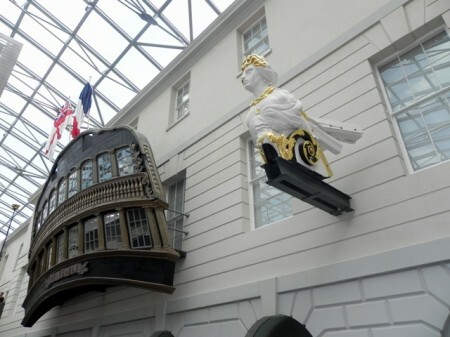 It houses an interesting exhibition about the Tudor and Stuart royal families and their relationship to Greenwich and also lots and lots of paintings of ships and the sea. 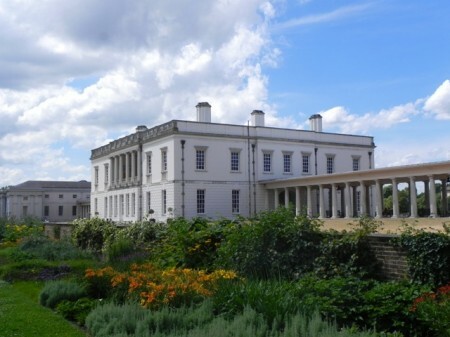 Travel-with-kids tip: The Queen’s House really isn’t appropriate for kids (unless you’ve got a child who really likes to look at paintings of boats) but it is just minutes from a fantastic playground. Even if you don’t want to spend a lot of time looking at the art, the building itself is worth seeing, especially the famous Tulip Stairs. I’d recommend taking turns while the kids get their wiggles out. The Maritime Museum, housed in what used to be the Royal Hospital School next to the Queen’s House, was our final stop in Greenwich. There’s lots to see there as well, and even though the boys were deservedly tired after a busy morning and early afternoon, we still managed to explore much of the museum including the temporary exhibit of toy boats and the Your Ocean gallery where we explored human dependence on the sea and what we can do to help keep it clean. Surprisingly the boys were most interested to see the uniform Lord Nelson wore at the Battle of Trafalgar. They both became fascinated by Nelson after hearing of his heroics and famous last words while standing at the foot of his column in Trafalgar Square on our Fat Tire bike tour earlier in the week. We also saw his tomb in the crypt at Saint Paul’s. And so it was a thrill to see the jacket – complete with its musket ball hole in the shoulder. Even if you’re not interested in ships or the sea, it’s worth going into this lovely space with it’d glassed courtyard and sculptural artifacts. 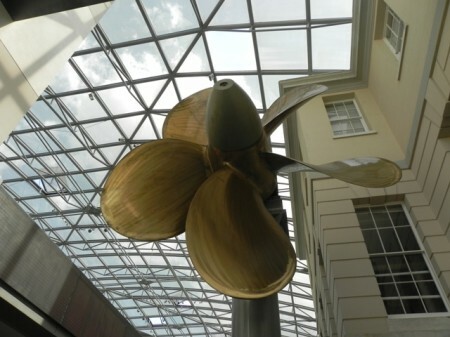 And if your kids like ships better than space, I’d recommend spending your day in the reverse order than we did as we definitely only scratched the surface of what the Maritime Museum has to offer. 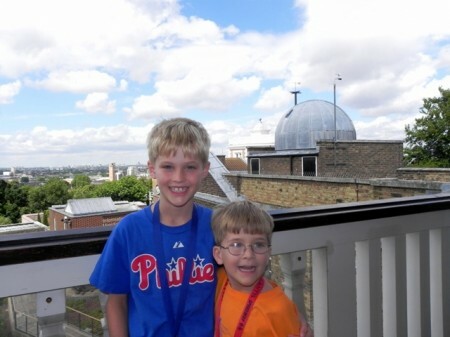 Travel-with-kids tip: The Greenwich museums share a common website. Check it out in advance of your tip to see what family programs are being offered. By now the boys were running out of steam. I longed to sit and drink a pint at The Old Brewery which has a lovely outdoor seating area right in the heart of the Royal Naval College. But looking at our two loopily tired kids Matt and I decided that our best bet was to head for the pier. And indeed, they were happy for a peaceful boat ride back to the city during the course of which Matt told them a long and involved “Scooby Story” about the Oyster King of Ramsgate who was stealing oysters and river dolphins. I do so love his Shaggy imitation – and wonder if our fellow passengers (the boat was quite crowded this time) now think that American children’s knowledge of literature is limited to 1970s cartoons. 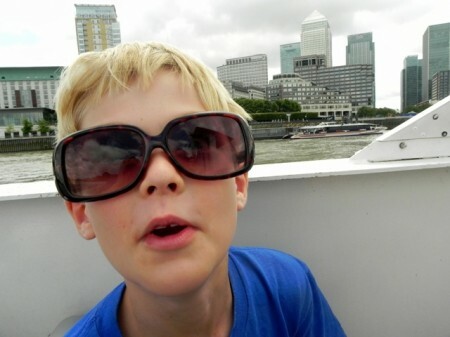 Greenwich is a bit off the beaten track but it is a great place to spend a day with kids when you’re in London, especially if you’re on a budget. The museums are free (although there is a fee to see the planetarium shows) and you can purchase an inexpensive lunch at the Greenwich Market. Our only costs for the entire day out were food and the boat ride (which cost about £32 or $50 for round-trip tickets for all of us). 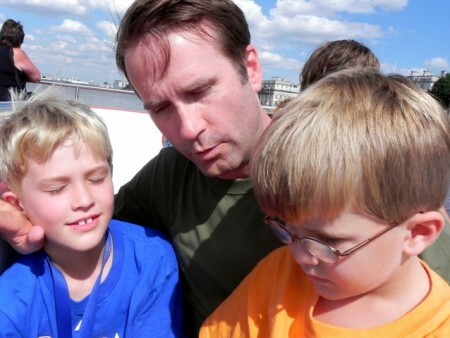 Children under five can ride the boat for free. For another, more local perspective on day trips to Greenwich, please see Let’s Do Something Different. Wow…!!! He has grown so much and it’s great to hear the you finally got the chance to visit some of the places you wanted to see. I think you are right about things re. much being closed for renovation/revamping leading up to the Olympics, and making sure to check. This is especially true with transport (and ESPECIALLY true with the Underground on the weekends). Always have a Plan B, and don’t be afraid to ask for help from staff! (and thanks for the link to my blog)! Great post! That is a wonderful boat ride. Thanks for the memories. I wished I had done more of the museums. So much to see, so little time. Thanks for sharing.